Born: 25 May 1879, Huddersfield, Yorkshire, United Kingdom. Died: 27 March 1951, Pietermaritzburg, South Africa. Robert Beckett Denison studied at the Yorkshire College of Science in Leeds (from 1904 the University of Leeds), where he was awarded the degree Bachelor of Science (BSc) and an 1851 Exhibition research scholarship. He continued his studies in Germany, studying electro-chemistry and electro-metallurgy at Aix-la-Chapelle and specialising in physical chemistry at Breslau (now Wroclaw, Poland). In 1903 he obtained the degree Doctor of Philosophy (PhD) at the University of Breslau with a thesis on the speed of migration of ions in acqueous solutions, entitled Beitraege zur direkten messung von ueberfuehrungszahlen (Leipzig, 1903). After further research in Berlin and at University College, London, which was reported on in a number of published papers, he was awarded the degree Doctor of Science (DSc) by the University of Leeds. While still in Germany he, in collaboration with B.D. Steele, developed what became a standard method of measuring ionic velocities in solution, namely the moving boundary method. Their joint papers included 'The transport number of very dilute solutions' (Journal of the Chemical Society, 1902), 'On the accurate measurement of ionic velocities' (Transactions of the Royal Society of London, Series A, 1906) and 'A new method for the measurement of hydrolysis in acquous solution based on a consideration of the motion of ions' (Journal of the Chemical Society, 1906). In 1904 Denison was appointed lecturer in chemistry at the Heriot-Watt College in Edinburgh, where he subsequently became assistant professor of chemistry. His publications based on his work there included 'Research on the relative rate of migration of ions in acquous solution' (1909), and 'Contributions to the knowledge of liquid mixtures' (1912), both in the Transactions of the Faraday Society. In March 1910 he married Ruby A. Newth, but they had no children. A few weeks later, on 17 April 1910, he arrived in Durban to take up an appointment as professor of chemistry and physics at the newly founded Natal University College in Pietermaritzburg. After two years at the college Denison was able to give up his involvement in physics and continued as professor of chemistry until 1939. He devoted most of his time to developing his department and teaching, in which he set high standards, leaving little time for research. His publications during this period included "The electro-motive series of the metals as an aid to the teaching of inorganic chemistry; with special reference to the action of acids on metals" (Report of the South African Association for the Advancement of Science, 1911, pp. 245-252); and "The formation of chemical compounds in homogeneous liquid systems: a contribution to the theory of concentrated solutions" (Ibid, 1912, pp. 132-147). These papers proved to be more or less the end of his research in chemistry, owing mainly to a lack of facilities and a heavy teaching load. Many years later, as co-author with A.P.D. McClean, he published "An accurate colorimetric method for the estimation of very small amounts of carbon dioxide" (South African Journal of Science, 1926, Vol. 23, pp. 253-258). Denison was an unpretentious, devoted and selfless man and an excellent administrator who played a leading role in college affairs. He was dean of the Faculty of Science from 1924 to 1926. In 1938 he succeeded J.W. 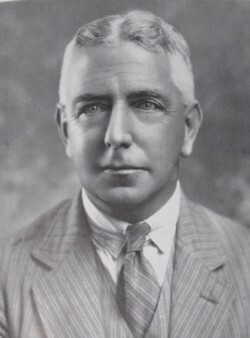 Bews as principal of the college, a position he held until his retirement at the end of 1944. The college's Denison Library was named after him. On the basis of his doctoral degree from the University of Breslau, the University of the Cape of Good Hope admitted him to the Master of Arts (MA) degree in 1911 and during 1915-1916 he was an examiner for the university's MA papers in chemistry. He was also a member of the senate of the University of South Africa (successor to the University of the Cape of Good Hope) and for some years served as a member of its council. In 1946 the university awarded him an honorary DSc degree. Denison was a foundation member and served on the council of the South African Association of Analytical Chemists (from 1921 the South African Chemical Institute), from its inception in 1912 to the end of his career in chemistry. He was elected president of the association for 1917/8. His spare time was devoted to golf, fishing and gardening. Coblans, Herbert. Robert Beckett Denison: A memoir. South African Industrial Chemist, August 1951, Vol. 5, p. 156. Google scholar. http://scholar.google.co.za Publications by R.B. Denison. Guest, B. Stella Aurora: The history of a South African University. Vol. 1: Natal University College (1909-1949). Pietermaritzburg: Occasional Publication of the Natal Society Foundation. Retrieved from http://www.natalia.org.za/Files/Publications/Stella Aurorae.pdf on 2018-10-16. National Automated Archival Information Retrieval System (NAAIRS). http://www.national.archives.gov.za/naairs.htm Documents relating to Denison, Robert Beckett / Denison, R.B. Petrie, A. Memoir of Dr Robert Beckett Denison. Theoria, 1952, No. 4, pp. 1-5. University of the Cape of Good Hope. Calendar, 1912/3, 1915/6, 1917/8.